What birthday traditions does your family hold? 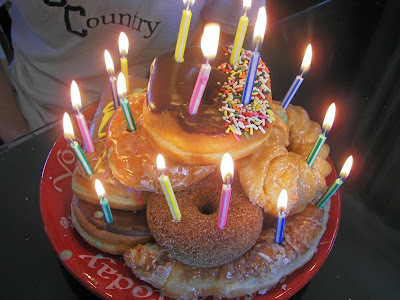 For us, we always celebrate by serving "Birthday Donuts" on the morning of our birthdays. The tradition began when we lived in an area where we could buy a huge, what they called "Texas-styled," donut. Since then we have moved and cannot buy huge donuts; the tradition mutated and we now buy normal donuts and stack them in a tower. This is a real treat for my children because we only buy donuts on their birthdays. For my husband, who is more health conscious, we buy him birthday bagels and stack them. We always use the "You are Special" plate that I received as a wedding gift some 22 years ago, to serve the donuts or bagels on. One of our other traditions is to always sing our version of the Happy Birthay song. My extended family has sung this song for as long as I can remember. After my Aunt Ionia died in 2003, the last sibling of my dad's family, my cousins and my siblings were sitting around discussing things. The birthday song came up and we talked about the possible origins of this song. No one knew where the song came from. 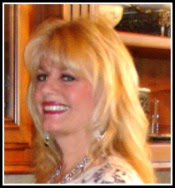 Later, I did a little research and found that we were singing a version of a song that used to be on the "John and Sparkie" radio program broadcasted in the 1950's. They would sing this song to recognize those children celebrating their birthdays in their studio audience. Big John was John Arthur who played a father figure to Sparkie a little boy. They opened up the radio program with "Teddy Bears Picnic," which was also a song that we sang at our home. 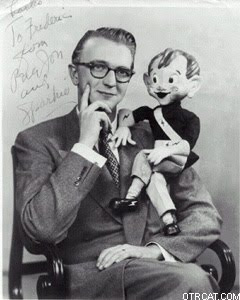 Pictured below is John Arthur and "Sparkie." If I recall correctly, there wasn't really a physical "Sparkie" when the show first started. I believe a contest was held to design or picture a "Sparkie" and as a result of that contest, a "Sparkie" doll was developed. Today is a birthday I wonder for whom. We know it's for someone right here in this room. 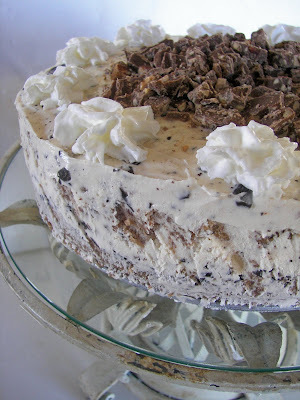 We also serve "Birthday Torte" which you can link to the post HERE for the recipe. 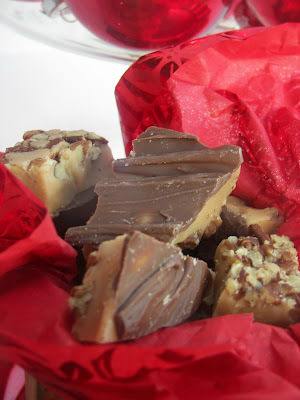 I have been making this recipe for our birthdays for at least thirteen years. What Birthday Traditions do you have? I would really love to hear about them! Please let me know about your traditions in the comments section. The tower of doughnuts looks great! What a fun tradition. My mom would make each of us the dinner of our choice on our birthday. Even after getting married I went back for her chicken parmesan! I love the doughnut cake very fun tradition. Oh how fun! We always let the birthday person decide what dinner will be and they choose their cake/dessert. Would love to have the tune for the birthday song. Where can I find it? That torte - I've gone back to look at it more than once. It will be featured by the Ponds this summer! I love family birthday traditions - we have ours and no matter how old the kids get, we'd better keep to all the traditions! That is such a great idea...my girls love donuts (but we try not to buy them too often)! Thanks for the idea! I am so glad you researched that song. We have more fun with it each year. Our best time was in January one year when we sang it to 4 different people, one right after another. It got crazier with each person. We do the exact same thing for our kids on their birthdays!! Donuts for the special day!! We actually just started this tradition last year...so easy, but makes them feel soooo special! I love the donut tower! My dear girlfriend does this every year for her childs classroom on her childs birthday. She takes in a giant donut tower instead of cupcakes! I have that same "Your Special" plate as well. But it was given to me only about 5 years ago. We have a special set of birthday dishes and the birthday person gets the plate that has the cake on it. The kids love that plate!? Also, the birthday person gets to choose their birthday dinner.